Is that someone gonna attack me? Is that someone gonna praise me? Is that someone about to post an inspirational comment? And when the wait prolongs, it would become unbearable. If only I knew who it was, I would have gone to his/her home and asked "Why da? Why are you taking time for ever to post one comment? Are you still choosing your words? Please post the comment soon". 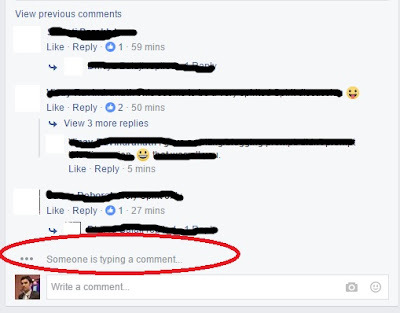 There are people who take at least 30 minutes to type a ten word comment. Such people are the ones who teach you the basics of anger management. Someone said that "patience is not the ability to wait, but the ability to keep a good attitude while waiting". Now don't tell me "Hey Chriz! If you can write a blog post on patience, why not have the same patience while waiting in the ATM queue to draw money". Don't you dare bring the "Soldiers in the border"dialogue. If yous seriously want to learn patience, try booking a ticket for Pongal to your hometown on IRCTC. Okay! That is a tried and tested old stale joke. I agree; but I am running out of jokes and that is why I am force fitting these one liners in this blog post. I am almost done with this post and still "that someone is typing a comment". Haha. Vayasaayiduchey. Palaya joke ellaam varudhey. What to do?